A Tablecloth Logo is an inexpensive way to get your corporate logo in front of your prospect. The face of your tablecloth is premium advertising space! A Tablecloth with your Logo will stand out at a convention. Corporate identity is enhanced and your prospect immediately recognizes you as a professional when you have your logo on your tablecloth. And regular customers easily find your exhibit as your tablecloth logo identifies where you are in a crowd. TIP! - Design your tablecloth with simplicity in mind. Don't get too "wordy" and expect your tablecloth logo to do all the selling. Your Tablecloth Logo should enhance your display stand. See additional tablecloths with logos. Lori working on an economy Tablecloth Logo for American Trauma Society, Pennsylvania Division. Their tablecloth logo is an excellent example of corporate branding. A Custom Tablecloth with text attracts attention with proper color selection. This Light Blue Tablecloth creates a soft, yet bold way to brand corporate identity. Color balance of your tablecloth logo is essential for eye appeal. Tablecloth colors may be of standard, pre-dyed at the fabric mill colors, or we can custom dye sublimate to the PMS (Pantone Matching System) color of your choice. For exact PMS color matching, it is essential you send us something with your PMS color on it. A company sell sheet or brochure works well. Economy tablecloth for "CareCredit" Dallas, Texas. 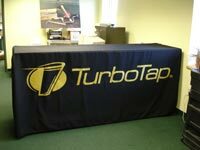 This Custom Tablecloth with Logo measures eight feet long, forty-one inches high and twenty four inches deep. Custom Tablecloths with your logo may be sewn to your specifications. See Tablecloth Care. *See what others have bought at special internet sale prices! We give quantity and multiple item discounts for ordering a couple of different things. We made this Custom Tablecloth for "Jazz at the Lincoln Center," New York, New York. Their Tablecloth Logo was a "Fitted" Tablecloth. Most of our Tablecloth Logos are made with woven polyester because it's soft and durable. (Tablecloths may have extra water repellent added to them upon request.) We have used 50/50 polyester and cotton in the past, but the tablecloth was too "slippery." It would slide too easy across our work tables and want to slide off the other side when we were applying the tablecloth logo. So I figured if we had those kinds of issues working with the tablecloth logo here at the shop, what kind of pain would it be for you at your show if your tablecloth was sliding all over the place? So we stick primarily with our tried, proven and true 100% polyester tablecloths. Tablecloth with Logo shipped to Lincoln Center, New York, New York. See additional Tablecloth Logo images.